In addition to providing turnkey solutions in injection moulding, blow moulding, vacuum forming, development of dies and tools we provide services for after moulding operations. Owing to our experience, we are offering Bakelite Moulding Service to our clients. These services are rendered using advanced technology and high-quality material to achieve the set industry norms. We are offering this array at very reasonable rates within the given period of time our customers. Our firm has made unbelievable breakthrough in the providing PVC Interior Moulding Services. Attributed for its flexibility and reliability, these services are broadly demanded. More to this, we deliver these to our clients after understanding their budgetary requisites. Clients can acquire these services at most affordable rates. 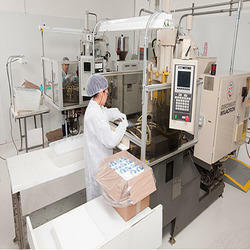 Our organization is rendering Plastic Moulding Job Work. This service is completed at low prices. This service is handled by professionals who have affluent industry practice and skill. Additionally, this service is widely admired in the market for their timely completion. We have set up our factory plastic injection molding machines. Owing to these amenities, we are capable to do all type plastic molding job work. We also pursue complicated methods of painting during manufacture progression. We are actively committed towards offering Plastic Moulding Job Works to our clients. The offered services are highly demanded in the market and provide maximum satisfaction to our clients. These services provided to our valuable client in pocket friendly prices. To accomplish the varied desires and necessities of clients, we are providing Plastic Molding Works to them. This rendered work is highly accredited in market for their reliability and steadfastness. To add, our professionals use cutting-edge machines and methods to render this work. Minimum Order Quantity :- 1000 Pieces.We proudly announce ourselves as the leading name devotedly engaged in providing Plastic Molder. We have carved a niche amongst the most dominant names in this domain, involved in providing Plastic Injection Moulding Job Work.